Choosing among products can be more difficult if shoppers think more about the process of using an item rather than the outcome of the purchase. 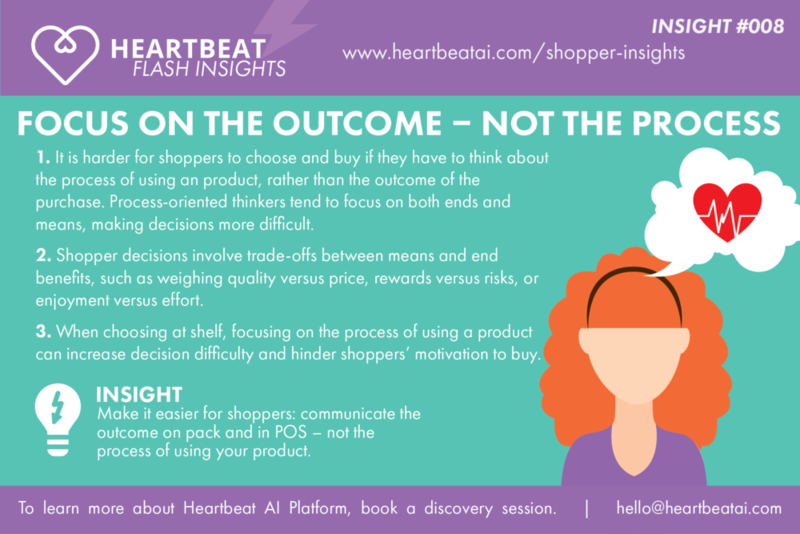 Shopper decisions involve trade-offs between means and end benefits, such as weighing quality versus price, rewards versus risks, or enjoyment versus effort. Process-oriented thinkers tend to focus on both ends and means, making decisions more difficult. When choosing at shelf, focusing on the process of using a product can increase decision difficulty and hinder shoppers’ motivation to buy. Make it easier for shoppers. On pack and in POS, communicate the outcome– not the process of using your product.